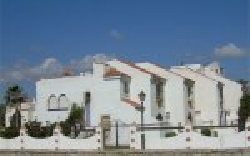 VILLAS AND APARTMENTS TO RENT IN CASARES, SPAIN. 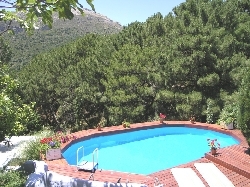 Welcome to our selection of holiday homes to rent in Casares, Spain. Casares is also known as �the white village� and it's not difficult to see why as you drive into the mountains behind the Costa del Sol. Make sure you pull over by the side of the road to take a picture of the square white houses seemingly balanced on top of each other before you enter the village itself. Although Casares is a popular day-trip with tourists staying on the coast, the twisting road that takes you there has put many of the coach companies off providing organised tours, which helps keep the crowds to a minimum. The narrow streets of Casares will give way shortly after you enter to the open space of the main square, where there is a small caf� with one of the most spectacular roof terraces probably in all of Spain. On a clear day, you can enjoy your drinks and snacks with a view of the Rock of Gibraltar in the background. You may notice a statue in the square of Blas Infante, a Nationalist leader who was executed during the Spanish Civil War. His birthplace has been turned into a small museum dedicated to his life. Towering above the picture postcard white houses of Casares is the Moorish fortress that holds some of the oldest buildings in the village, many of which now lie in ruins. These include the church, Iglesia de la Encarnaci�n, built in 1505 and the Hermitage de la Cruz, still pitted with bullet holes from the Civil War, as well as an open air auditorium, sadly unused for performances these days. It's quite a climb to the top of the village, and through the gates of the fortress, but the view is well worth the effort. A few kilometers from the visitor's centre at Casares, towards the smaller village of Manilva, those willing to head off the beaten track a little can enjoy discovering the remains of a Roman town called Lacipo. Unlike many Roman remains, these are left alone in a field, allowing you to explore them thoroughly at your own leisure. The layout of houses can be clearly seen in the structures that remain, including some sections of the defensive wall that stand over 30 feet tall. Again, those who take the time to climb the hill where Lacipo once stood will be rewarded with fantastic views of the surrounding countryside, including the white houses of Casares itself. 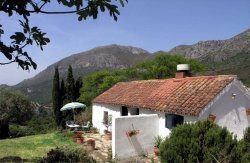 Looking for self catering holiday accommodation in Casares? Then below is a selection of apartments in Casares and villas in Casares that can be rented direct from their owners. You can either click on each listing for further details or you can use our search engine on the left if you are looking for something in particular. The Iberian and Roman town of Lacipo - Why not go and view the unguarded ruins of The Iberian and Roman town of Lacipo? Lacipo was created in the second century BC for the local community. Over the years, the town grew a considerable amount making most of its money from olive oil. Castle Church - The Castle was built in 1505 by �Bull� of Pope Julius II. The church is situated at the very highest point in Casares. It was built on an old Muslim mosque where the houses within the village where built around. The Municipality of Casares is located in Malaga and is home to the famous village of the same name. Known as the 'white village', Casares can be seen climbing into the mountainside. The white houses look very much like they are balancing on top of each other.